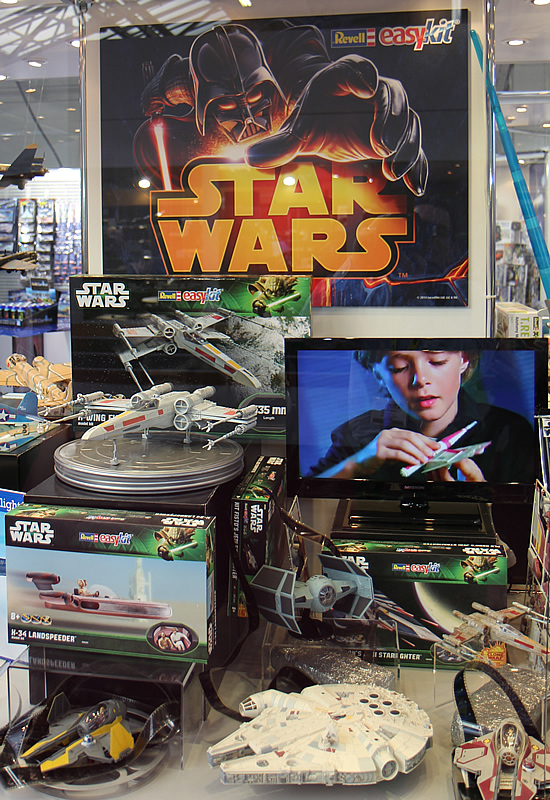 This past week saw Toy Fair come to London, and over three days, 236 companies exhibited their products for members of the UK toy industry. 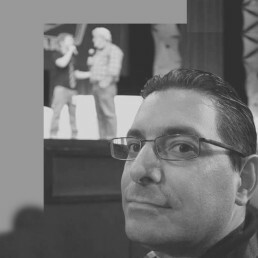 I was lucky enough to go on Press Day, normally the first day of the show. 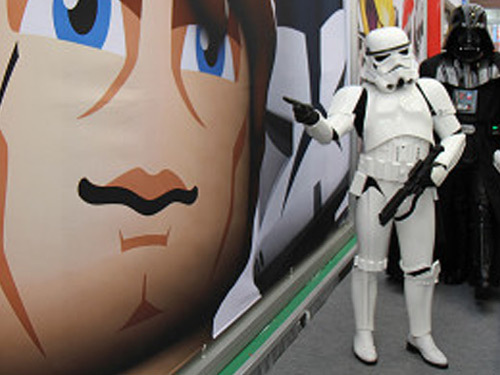 Let’s start with the two biggest companies that create Star Wars products: Hasbro and LEGO. As I explained in a previous blog entry, taking photographs and sometimes even discussing what is seen at the UK Toy Fair is frowned upon, and that was the case this year with Hasbro and LEGO. 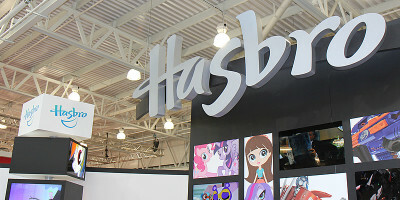 A lot of what Hasbro featured must remain secret until the International Toy Fair in New York (just three weeks away), although I can talk about most things on show at LEGO. Photographing items at either stand was prohibited. 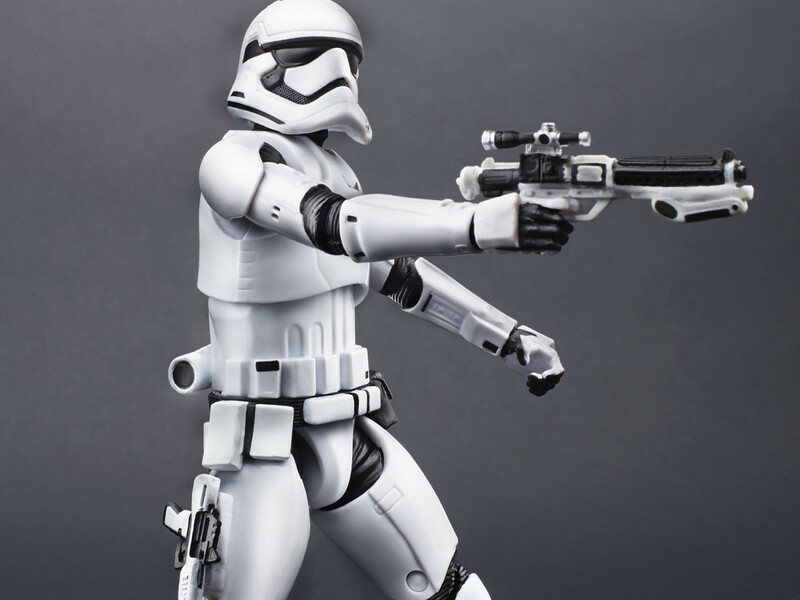 Hasbro — The future of the Black Series, both 3¾” and 6” lines, looks great and there will be a number of new figures coming in each range in 2014. The 5-point articulated figures found in Saga Legends and the Mission Series will also continue in 2014. 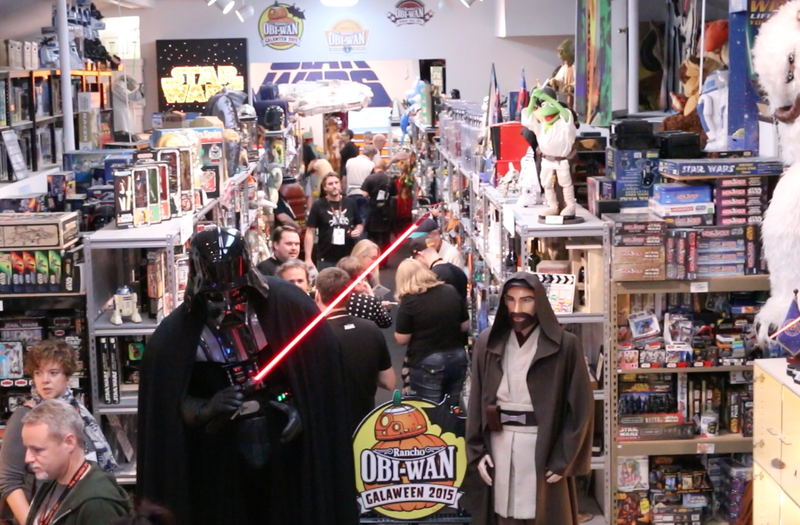 There were only 3¾” figures on display including the Inquisitor figure (from Star Wars Rebels Saga Legends) that was revealed here at StarWars.com on December 30. Role-playing items continue this year under a new sub-brand called Armor of which several new items were also shown. Snowspeeder (set #75049, $39.99, 278 pieces) — The iconic vehicle is back with some new minifigures and a new shooting harpoon gun. 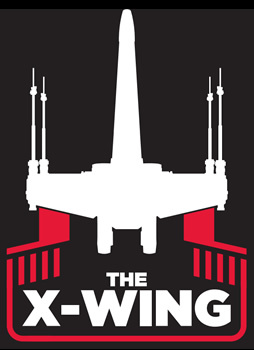 B-Wing (set #75050, $59.99, 448 pieces) — This is only the third time that LEGO has released this vehicle and it comes with new minifigures. Jedi Hunter Frontier (set #75051, $69.99, 490 pieces) — This is the only set for 2014 from the continuing Yoda Chronicles. 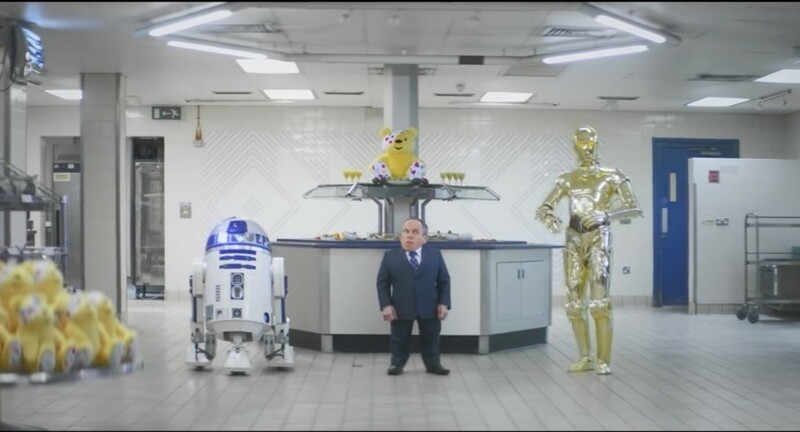 It features JEK-14 along with Hammerhead, RA-7 protocol droid, and an astromech. Mos Eisley Cantina (set #75052, $79.99, 615 pieces) — This has only been produced once before and makes a welcome return. It’s a bit smaller than we’d have hoped for and includes Obi-Wan, Luke Skywalker, Greedo, and three members of the Mos Eisley Cantina. 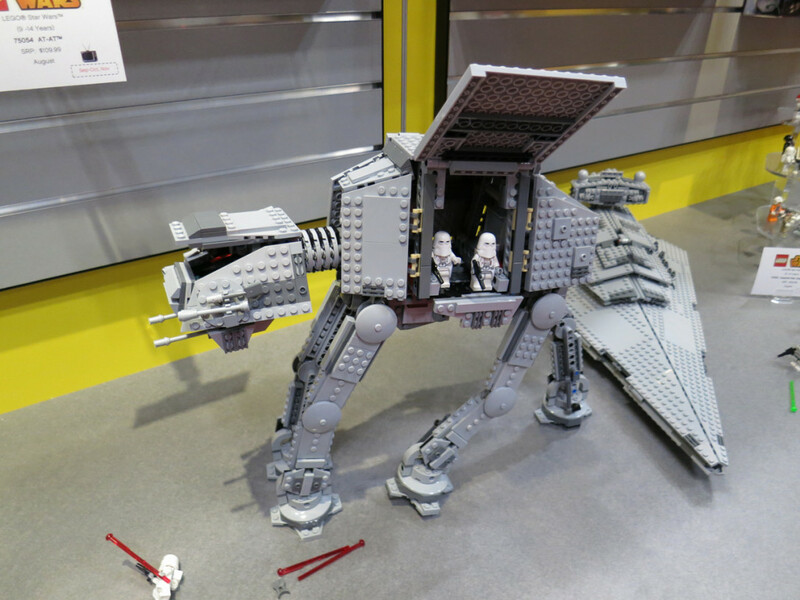 AT-AT (set #75054, $119.99, 1,138 pieces) — The snowspeeder needs a companion piece and the AT-AT is the perfect match; it seems a little bit smaller than previous releases but comes with five minifigures, including AT-AT Driver, General Veers, Snowtrooper Commander, and two Snowtroopers. Imperial Star Destroyer (set #75055, $149.99) — This set looks incredible, and much more stable than the previous release. It also features six minifigures including Darth Vader, two Stormtroopers, and three Imperial Officers, as well as a highly detailed Emperor Palpatine hologram microfigure! Also on display was the Advent Calendar for later this year which centers upon a certain infamous Dark Lord of the Sith who was redeemed at the end of Return of the Jedi. 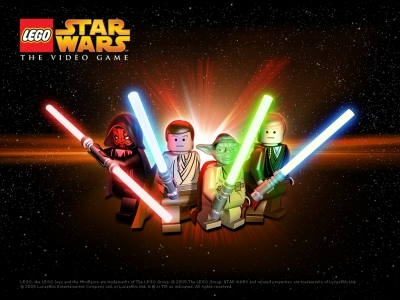 LEGO celebrates its 15th anniversary of LEGO Star Wars in 2014 and it will be interesting to see if there’s anything special to mark this. 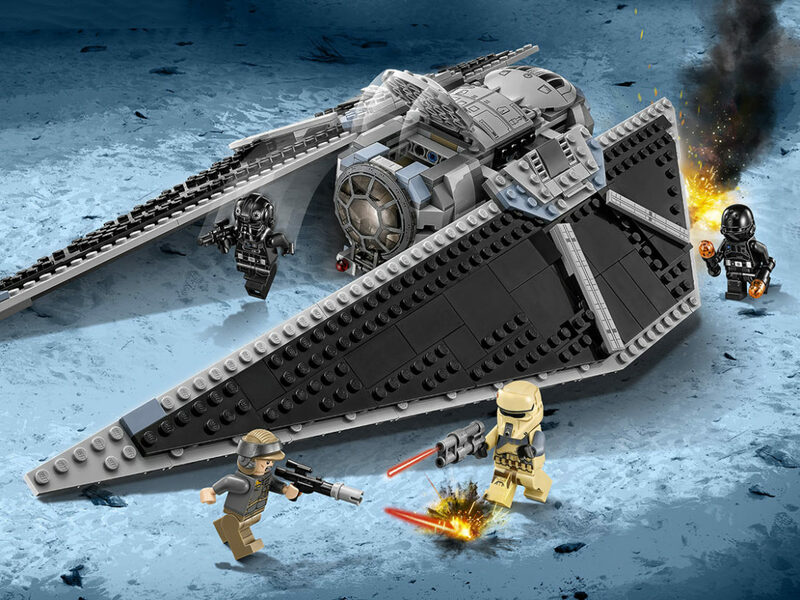 Whilst on the topic of LEGO, the company behind the LEGO light-up keyrings, Re:creation, will add Jango Fett and Chewbacca to their product range later this year. Amerang, the UK distributor for eFX, Gentle Giant, Kotobukiya, and Sideshow Collectibles, had an impressive range of already announced products on their stand including the Stormtrooper Commander Premium Format Statue and Blackhole Stormtrooper Premium Format Statue from Sideshow, eFX Strormtrooper Helmet from Episode IV, Gentle Giant AT-AT Bookends (now sold out directly at Gentle Giant), ArtFX+ Stormtrooper and Jango Fett Statues from Kotobukiya, Sixth Scale figures from Sideshow including Darth Vader from Return of the Jedi, Yoda from Episode III and Darth Malgus from The Old Republic, and a variety of chopsticks and silicone ice trays from Kotobukiya. 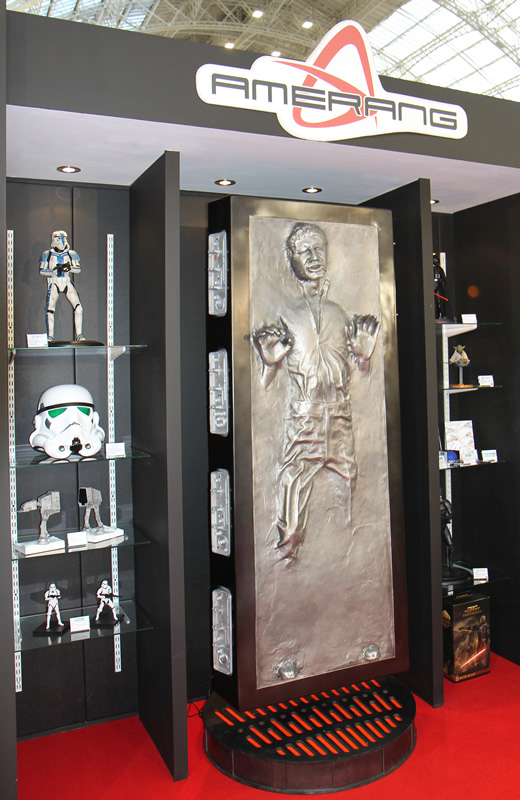 This was all topped off with the most impressive life-size Han Solo in carbonite created by Sideshow. 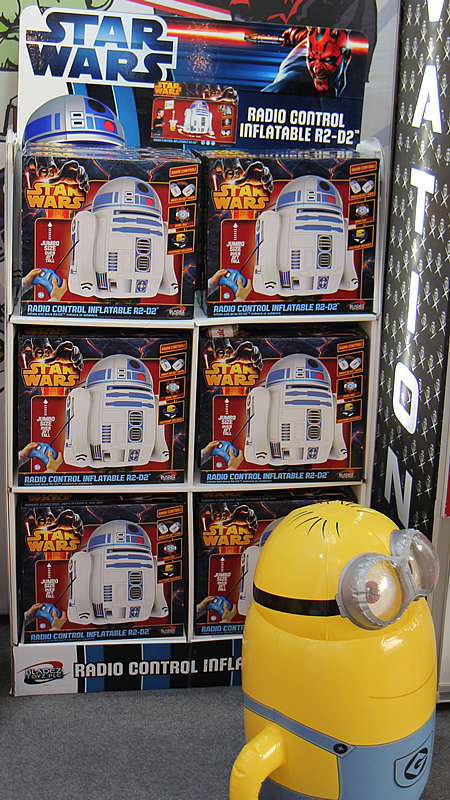 Two years ago we were blown away by the remote control inflatable R2-D2 from UK company Bladez which stole the show. This year they are busy working on three new items for the holiday season, including Yoda, Darth Vader, and the Millennium Falcon. While not on display, they showed us the prototypes and they look excellent, and in addition to being remote control they are also set to include sound features as well. Bluw are a new Star Wars licensee and are bringing out three new bling bagged Star Wars products for 2014. The first are Spin Strikers which is a new collectible game that allows you to pick your favorite Star Wars characters from the launcher and pit them against one another in the available combat arena — the winner being the last one standing. There are 24 different characters to collect, including six exclusives only available in select packs. 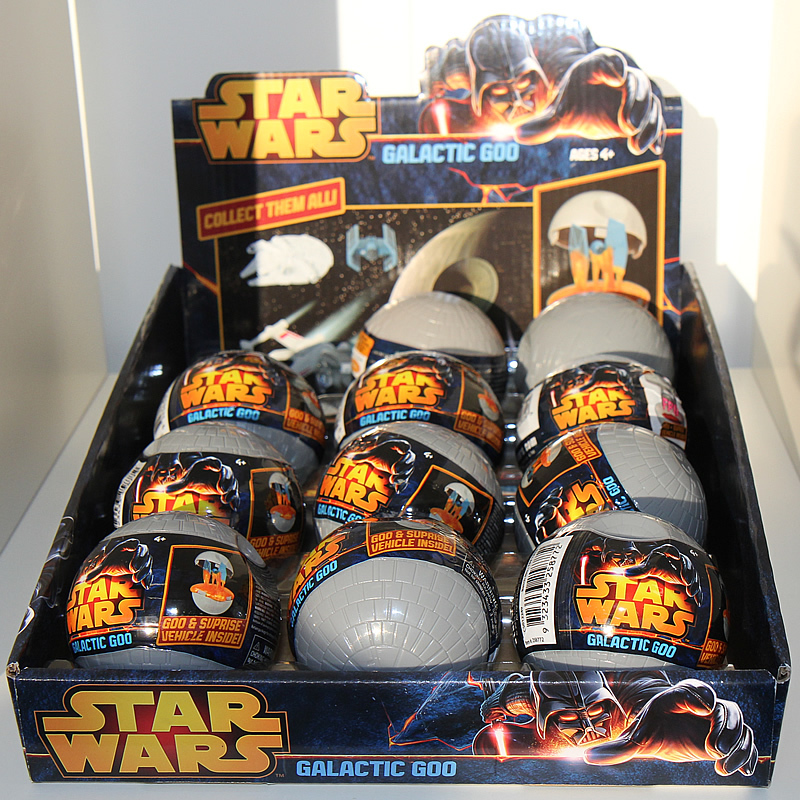 Next up is Star Wars Slap Attack featuring 24 character chips which you need to slap down your sticky lightsabers to pick up before your opponent (there are several different packs available), and finally, Star Wars Galactic Goo comes in a Death Star and amongst the Goo you’ll find one of six iconic Star Wars ships. Together Plus offered the Death Star Bird Feeder a couple of years ago and since then have released paper-based Star Wars characters featuring Boba Fett, Admiral Ackbar, Darth Vader, TIE Fighter Pilot, Luke X-wing Pilot, and Yoda. 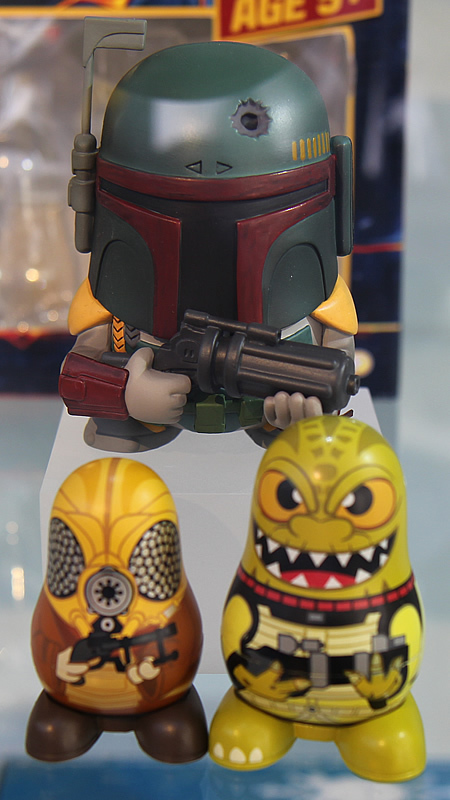 Last year they showed us drawings of prototype versions of their Chubbie Russian Doll concept — this year the finished hand-made prototypes were on display and were most impressive featuring C-3PO (with R2-D2 and Jawa), Yoda (with Mace Windu and Obi-Wan Kenobi), Chewbacca (with Han Solo and Greedo), Boba Fett (with Bossk and Zuckuss), and finally Jabba the Hutt (with Bib Fortuna and Salacious Crumb) — all of which will be available later this year. 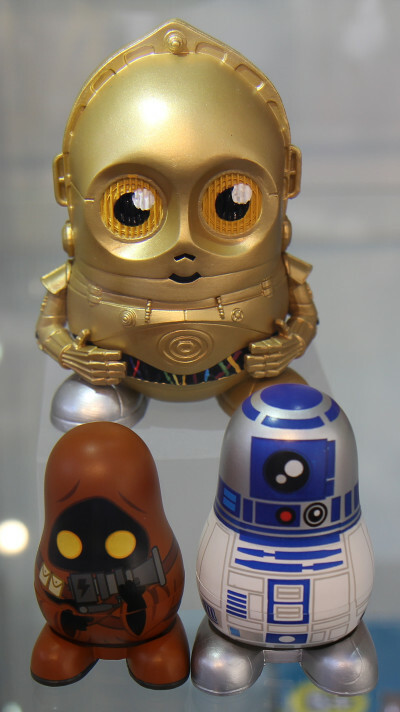 Zappies will continue their successful Star Wars Slap Snap Wristbands with new products and hard to find rare Wristbands that will only be available in select packaging. Zeon expand their vast range of Star Wars items with a new R2-D2 Cookie Jar, R2-D2 Pizza Cutter, and new figural mugs featuring Darth Vader and Stormtrooper. Revell have been making their easy-kit models for many years; now their range expands to include many new and re-released items at varying price points. Following the launch of four new card decks in the middle of 2014 — Ralph McQuarrie, Good vs Evil, Weapons, and Battles — Cartamundi have just released the same four decks in the US. Cartamundi US are expected to show off some new products in New York and I can’t wait to see how they turn out. Paladone acquired the Star Wars license in May 2013 and have just started to produce various novelty products, including a size chart that accommodates everyone from Yoda to Chewbacca (standing some 2.3 metres high), a Lightsaber Telescopic Stylus (I want one of these! ), Lightsaber Pens, Lightsaber Duel 3D Motion Mug, Death Star Juggling Balls, Fridge Magnets, and Pin Badges (buttons). The final company we visited was Underground Toys/Gear4Games, who promised to have more new products on display in New York. 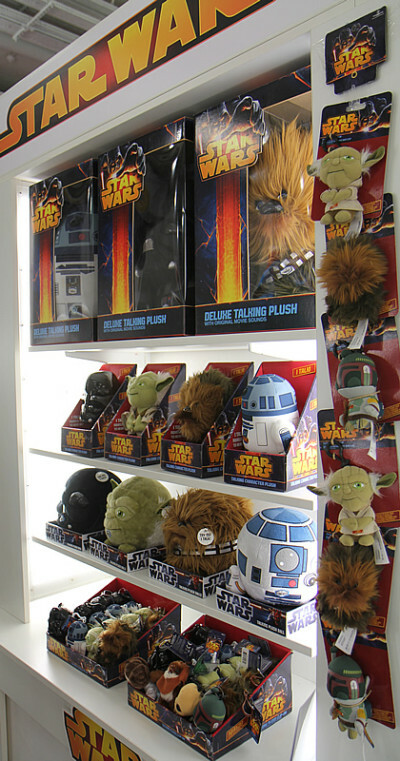 New items on display at the UK show included Star Wars travel card holders and a 12” Talking Jabba Plush. 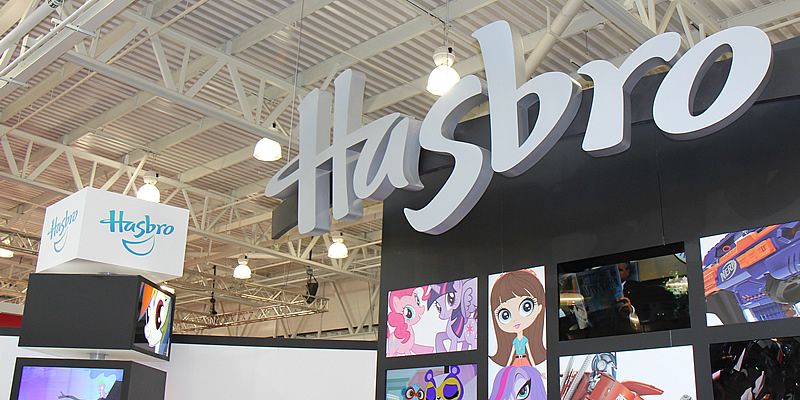 I can’t wait for the International Toy Fair in New York and to be able to talk more about what we’ll be getting from Hasbro and others this year — there’s some exciting products to be come. Until then, may I suggest you start saving your pennies; it could prove to be another expensive year in Star Wars collecting!